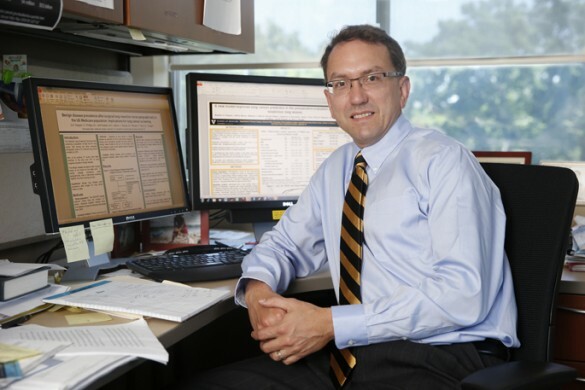 A study led by Vanderbilt University Medical Center investigators found that rates of benign lung disease diagnosis varied widely by state following surgery for lung cancer. The results could have an impact on clinical guidelines and health policy for lung cancer screening. The study was presented by Stephen Deppen, M.A., M.S., a doctoral candidate in Epidemiology and database analyst, during the recent American Association for Cancer Research (AACR) annual conference in Washington, D.C. Deppen received the Aflac-AACR Scholar-in-Training Award for this poster presentation during the conference. Cancer screening for patients at high risk for lung cancer is being adopted in some medical practices following results from the National Lung Screening Trial (NLST), which found that low-dose computed tomography (CT) screening led to a 20 percent reduction in lung cancer mortality compared with chest X-ray. However, the NLST also revealed that most of the positive screening results were false positives and 24 percent of subsequent lung surgeries were negative for lung cancer. The improved mortality from CT screening arose from early diagnosis and treatment of lung cancer in the NLST. Deppen and his colleagues wanted to determine if there were regional differences in the rates of benign disease. The investigators examined the 2009 Medicare data on 25,362 patients to see if there were large variations between states in the prevalence of benign disease after a lung operation for known or suspected lung cancer. The benign prevalence varied widely, from 1.2 percent in Vermont to 25 percent benign disease in Hawaii. The investigators said the causes of the differences by state are unknown at this time and may arise from practice variations, local infectious lung diseases that cause granulomas and other benign tumors or something that is still unknown. Deppen said in states with a higher rate of benign lung disease more false positives will be found and more individuals will undergo operations for possible lung cancer. These operations can involve substantial risks. Deppen said more surgeries for benign lung disease may result in more deaths and harm from the diagnostic process which also reduces the benefit observed in the original NLST. The investigators are trying to determine the cause of regional variations in rates of benign lung disease. Other investigators who contributed to the study include Sharon Phillips, MSPH, Melissa McPheeters, Ph.D., MPH, Melinda Aldrich, Ph.D., MPH, Jeffery Blume, Ph.D., David Penson, M.D., MPH, Yu Shyr, Ph.D., and Eric Grogan, M.D., MPH. This work was supported by VA Career Development Award (10-024 – Grogan), Vanderbilt Clinical and Translational Scholars K12 Award, AHRQ (1 R03HS021554-01).